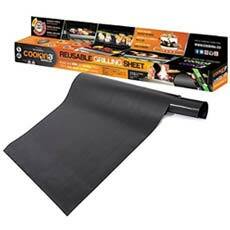 The Cookina grilling sheet is plastic looking you would never guess it performs that good on griller. By cutting the cooking period by a considerable amount the Cookina Grill allows you to achieve a flavorful, juicy and tasty meal. Besides it has been rated as one of the safest griller to use in the market today as most of its users have expressed its high performance delivery. There are no flares up that occur when using the Cookina grilling sheet reason for its health promotion. It is relatively affordable and has made grilling cleaner and tastier. The Cookina grilling sheets is a product manufactured by the company Generic in Quebec. The manufacturers of this kitchen tool have expressed sheer love and admiration for this product. They claim that this product enables a cleaner and more hygienic grilling experienced compared to your regular grilling. They also claim that their Cookina grilling sheets are non-sticky and are easy to wash. They also further claiming that the use of these sheets produces a more juicy, flavorful and tasty food than with direct heat. What’s more is that they promise you will not see flare-ups as you are accustomed to which helps minimize the level of bacteria that gets to the meat during grilling. How does Cookina Grilling Sheet work? The Cookina Grilling sheets use their PTFE coated sheets to make grilling an easy and cleaning experience. By holding your meat the sheets allow an even distribution of heat around your food. The sheets are perfectly made to ensure they remain safe and intact even in the highest of temperatures. The sheets are flexible enough to enable them to be cut to sizes of your own choosing. Has low co-efficient of friction and has non- adhesive properties. Provide a convenient additional grilling space. To enable to cut it to your own favorable sizes. This will also directly correspond to the amount of non-stick layers. Thick enough to enable the grilling sheet to heat up fast but still evenly distribute. This helps avoid overheating and burning or Centre heating and cooking of one place. The Cookina grilling sheet claims to bring out the grill burnt marks. However many users have not seen them. But honestly where do you get grill marks after placing a mat on top of the grill. Advantage about this is that this is actually a healthier option compared to direct grilling. Clean your Cookina Grilling Sheet preferably with warm soapy water and then dry it off. Preheat your grill first. Then place the Cookina grilling sheets on top of your griller. You can cut the sheet in half; so you can grill two different foods at once. Leave some room at the edges of the grill to allow for air and ventilation. Once you are done cooking let your Cookina grilling sheets cool before washing and again drying them off. Do not cook the sheets higher than 500 F (280 C). There are no side effects associated with using the Cookina Grilling mat. Grilling mats when doing a purchase can quiet look the same especially since they all look alike with almost equal features. However look closely at the quality of the Cookina Grilling sheet and compare it to its other competitors. The Cookina sheets are heavily coated with PTFE thus more durable, large sheet size to enable ease of manipulation to desired sizes, enough thickness for even heat distribution. There is also nothing as crucial to a product that fulfills its promises. The Cookina Grilling sheet is the easiest to use and most fun having in your home.